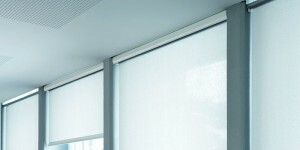 The interior roller blind Soloroll, which can be mounted in front or on the side with or without guides, is eye-catching with its filigree design. A large selection of weaves and colors are available. 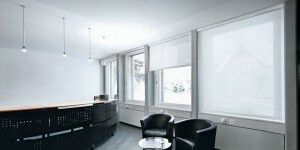 The air-permeable weave reflects the absorbed solar energy – for full exposure and visual transparency. Soloroll provides every room with the solar shading it needs while creating a comfortable room ambiance. Box in sizes 55 mm made from extruded aluminum, colored in accordance with Premium Colors, with fastening for wall or ceiling installation. Fabric spindle (tube) made from aluminum, drop profile made from extruded aluminum with gray plastic end caps fitted on the sides. Colored drop profile in accordance with Premium Colors. Operation using chain. Material according to applicable collection Griesser price group 1 and 2. Suspended treely without guides. Box in sizes 70 mm made from extruded aluminum, colored in accordance with Premium Colors, with fastening for wall or ceiling installation. Fabric spindle (tube) made from aluminum, drop profile made from extruded aluminum with gray plastic end caps fitted on the sides. Colored drop profile in accordance with Premium Colors. Operation using chain. Material according to applicable collection Griesser price group 1 and 2. Suspended treely without guides. Box in sizes 90 mm made from extruded aluminum, colored in accordance with Premium Colors, with fastening for wall or ceiling installation. Fabric spindle (tube) made from aluminum, drop profile made from extruded aluminum with gray plastic end caps fitted on the sides. Colored drop profile in accordance with Premium Colors. Operation using chain. Material according to applicable collection Griesser price group 1 and 2. Suspended treely without guides. Box in sizes 90 mm made from extruded aluminum, colored in accordance with Premium Colors, with fastening for wall or ceiling installation. Fabric spindle (tube) made from aluminum, drop profile made from extruded aluminum with gray plastic end caps fitted on the sides. Colored drop profile in accordance with Premium Colors. Operation using crank or 230V whisper motor. Material according to applicable collection Griesser price group 1 and 2. Suspended treely without guides. Soloroll II Conventional 60/80 chain. 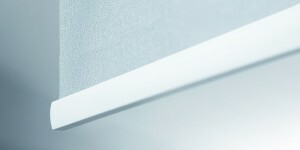 Fabric spindle (tube) made from aluminum with 60, 80 and 100 mm fastening supports in white, gray or black for wall and ceiling installation, end caps made from plastic in white, gray or black. Drop profile made from extruded aluminum with gray plastic end caps fitted on the sides. Colored drop profile in accordance with Premium Colors. Operation using chain. Material according to applicable collection Griesser price group 1 and 2. Suspended treely without guides. 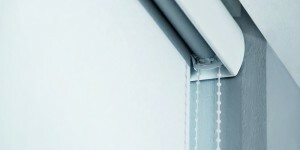 Fabric spindle (tube) made from aluminum with 60, 80 and 100 mm fastening supports in white, gray or black for wall and ceiling installation, end caps made from plastic in white, gray or black. Drop profile made from extruded aluminum with gray plastic end caps fitted on the sides. Colored drop profile in accordance with Premium Colors. Operation using crank or 230V whisper motor. Material according to applicable collection Griesser price group 1 and 2. Suspended treely without guides.